Vapor Eze humidifiers and more! Your well-being is affected every single day by the personal care products you use. Our goal is to create and educate people on truly natural products that have a positive effect on both you and the world you live in for the good of your well-being. Dr. Bronner's Magic Soaps is pleased to announce that all classic liquid & bar soaps are now not only certified under the USDA National Organic Program, but also certified Fair Trade! Quality ingredients make Dr. Bronner's Soaps superior to the rest. Natural Essential Oils for making soaps, bath products, and home cleaning. Most of our selection of Essential Oils are certified organic as well. DynaFlex tools for carpal tunnel and arm strengthening, Yoga Mats, and more. Large selection of classic shaving supplies and tools. Shaving mugs, shaving soaps, straight razors, double track razors, and stypic pencils are just a few of the shaving tools we have in stock. 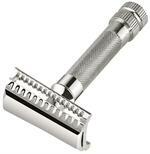 Highest Quality double track razor made by Merkur. Gold Plated razor handle for excellent shaving and elegant presentation. 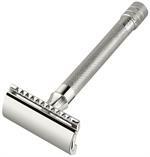 Classic style with a polished chrome finish make this heavy duty double edge safety razor with slant head the choice of many discriminating shavers. The slant head meets the curviture of the face for a comfortably close shave. Classic style with a polished chrome finish make this long handled double edge safety razor the choice of many discriminating shavers. The safety bar keep the blade away from your skin yet close enough to give you a smooth, close, comfortable shave. 10-pack of Merkur platinum coated stainless steel double edge razor blades. Fits all Merkur double edge safety razors. Fits most other brands of double edge safety razors. Blister pack. Col Ichabod Conk was a man who knew a thing or two about moustache wax. Our American Made Moustache Wax has a light, pleasant scent. 1 ounce jar. Colonel Conk’s Natural Pre Shave Oil is the first step to an excellent shave, a proprietary blend of 5 essential oils plus other enriching ingredients. A high quality product with a hint of menthol. A traditional off white shave mug with the original Colonel Conk logo (black lettering, a golden outer ring, and a dark green background). This classic style has been around for 100 plus years. All Natural After Shave Lotion with a bold, manly Lavender scent. 6 ounce bottle with easy to use pump. 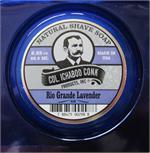 All natural shaving soap by Colonel Ichabod Conk. Bold Lavender scent with soothing, refreshing ingredients. Classic shave with modern care. 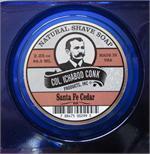 Colonel Ichabod Conk's Santa Fe Cedar shaving soap has a robust Cedar scent with Rosemary tones. All-natural ingredients for a great shave. Robust Cedar and strong Rosemary oils blended for a unique fragrance in our all natural After Shave Lotion. Put a little of the “Land of Enchantment” in your shaving ritual with our 5 piece Santa Fe Double Edge Shave Set. An exceptional complement to any bathroom décor. A great gift for the man who already has a favorite razor, this kit includes Colonel Conk's world-famous glycerin shave soap, a quality mixed badger brush and a ceramic mug for lather. If you want your shave to be invigorating and refreshing, our natural Southwestern Sun after shave lotion is just the scent for you. An all-natural shaving soap, our Southwestern Sun shave soap bar is a refreshing citrus blend with nourishing oils for the perfect shave. ust like grandpa used. Faux ivory handle with pure dark badger hair bristles. Great beginners brush. Stone alone measures 5.5" X 1.5" Total length including handle is 12", approx grit size 800-1000. A short medicated stick, used to slow bleeding from nicks and cuts. 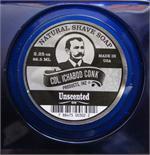 Super Size bar of Almond Shaving Soap by Colonel Ichabod Conk. Infused with Almond and Avocado oils for the perfect shave. Amber Super Shave Soap is a 3 3/4 oz. size. Made with Avocado Oil and Vitamin E for a soft, smooth shave. A light tropical scent of Bay Rum in a super sized shaving soap bar. With avocado oil and Vitamin E for a great shave. This jumbo sized off white shave mug has a black shave brush decal accenting the bottom rim. It's larger capacity hold a super shave soap with plenty of room left over to work up mountains of lather. Designed to fit comfortably in a large man's hand. Colonel Conk’s Natural After Shave Lotion is the third and final step to your perfect shave. A clean, natural fragrance with no fuss. Just a great, smooth finish to your perfect shave. With natural moisurizers. Unscented shaving soap for the man who likes to keep it simple. fragrance free and made with all natural ingredients. Watertight Traveling Shave Soap. For the same great shaving soap, in a convenient travel proof container. Solid Walnut wood base with spot for your shaving mug, the chrome stem features two holders: for your brush and razor. Colonel Conk's brush and razor stand has a walnut wood base with gold-toned findings. Base fits most shave mugs. World Famous Amber Glycerine Shave Soap. 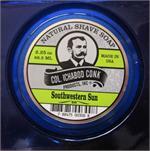 Each bar of Colonel Conk's shaving soap is a long lasting soap, rich in natural nutrients. The shaving soap provides a perfect buffer between your skin and the blade. Dr. Bronner's 8 ounce liquid bottle of lavender Soap is a refreshing and relaxing scent. Made with certified organic ingredients, Dr. Bronner's Lavender Castile Soap is a treat for your skin.